You may be realizing that most conventionally made products out there contain a lot of toxic chemicals. Not only that, many of these products are harmful to our environment in a number of ways. Making things yourself not only saves you money and helps the environment, but it lets you know where your products are coming from and exactly what has been put in them. You can make anything from food items to personal care and cleaning products, all in very simple ways. Homemade Ketchup — This ketchup won’t break the bank, tastes better than the real deal, and contains no added sugar, so it’s good for the whole family. Homemade Mayonnaise – This is a great recipe for any mayonnaise lover out there wanting to make their own at home. It’s simple and easy and tastes better than the store-bought versions. Peanut Butter – It is so simple to make this pantry staple it would be silly to buy it. With only three ingredients, you can make a tasty peanut butter that you can feel good about giving to your kids. Sourdough Bread – This is a classic recipe for you to make and stop buying your normal weekly loaf of bread, laden with artificial ingredients and preservatives. Nothing beats the smell of freshly baked bread. Homemade Butter – Instead of buying preservative-laden butter from the store, make your own butter with just four ingredients and a standard kitchen mixer… so simple yet so tasty. Homemade Yogurt – This recipe makes a thick and creamy yogurt that would rival any store-bought version. Once you learn this method you won’t be buying it again! Salad Dressing – This simple recipe for homemade salad dressing will jazz up any old salad and make it fabulous. Forget the store bought versions —get your aprons on, and get making. Homemade Maple Syrup – This classic sauce is so expensive these days, but did you know it is really simple and easy to collect your own? Honey Shampoo – This shampoo helps reduce frizz, combat dandruff, and moisturizes and softens you hair all in one. A natural, kind-to-your-skin shampoo that will make you think twice next time you are in the store. Coconut Oil Deep Conditioner – With just three ingredients, you can whip up an economical, natural, and luxurious conditioner to treat your hair, leaving it soft, manageable, and shiny. Body Wash – If you want to save money but have little time to spare, then this is the natural alternative for you. A simple recipe and method that makes a soapy bubbly wash that’s great for all skin types. Shaving Cream – This shaving cream will leave your skin feeling soft and smelling fantastic. With ingredients like coconut oil, Shea butter, mint, and rosemary, you will feel invigorated and fresh after every shave. Squeezable Homemade Toothpaste – Ditch those commercial toothpastes and opt for this natural re-mineralizing toothpaste that encourages white healthy teeth and improves oral health. Minty Mouthwash – Not only is it chemical and alcohol-free, it costs practically nothing! Well, nearly nothing, at $0.02 /oz. You will save loads of money on this, and improve your family’s oral health at the same time. Super Strength Herbal Deodorant – Rather than use expensive chemical filled deodorants, why not make your own? This requires just a few ingredients, is “super strength,” and totally natural! Honey, Beeswax & Almond Oil Moisturizing Creme – This recipe was first devised almost 2000 years ago. Its thick, velvety, and decadent qualities will leave your skin silky smooth and hydrated. Homemade Natural Sunscreen – Most sunscreens contain toxic chemicals and other harmful ingredients that could actually damage you when they should be protecting you. Check out this natural alternative and make the swap. Cleansing Wipes – These organic wipes are totally natural and contain no hidden ingredients. Perfect for cleansing your face or as baby wipes for diaper changes. Mascara – Arsenic, beryllium, cadmium, nickel, lead, and thallium are toxins we do NOT want to be applying to our skin! So opt for this homemade version and you will save money and protect your skin. Tinted Lipstick – This recipe includes beeswax pastilles, Shea/cocoa butter, and coconut oil. It allows you to customize it with different natural powders, such as beetroot powder for red hues, cocoa powder for brown hues, and bentonite clay for a matte texture. Eyeliner – How would you like to be able to make your own natural eyeliner (which can also be used as a smokey eyeshadow) for just $0.24? If yes – then check this recipe out. Bronzer – This homemade bronzer is really easy to make, simple to customize, and so much better for your skin than store-bought varieties. A brilliant way of saving money, too. Natural Blush – Give your cheeks a rosy tint and brighten up your complexion with this easy natural blush recipe. 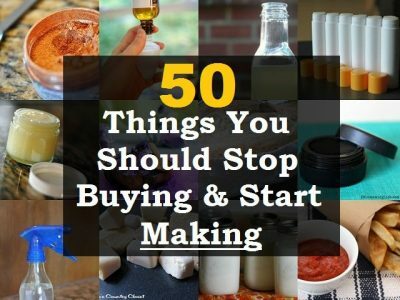 Cosmetics are so pricey these days, now really is the time to start making your own. Foundation – This foundation from Robin at ThankYourBody.com contains all natural and non-toxic ingredients, it works fantastically (see a before and after foundation picture on the blog), and is really easy to make. Under Eye Serum – Ingredients such as tamanu oil, vitamin E oil, grapefruit seed extract, avocado oil, carrot seed oil and more make this an effective anti-wrinkle eye serum that is totally natural. Copycat Burts Bees Lip Balm – This wonderful copycat recipe from HappyMoneySaver.com reveals how you can make your own version of Burts Bees Lip Balm (normally priced $2.50) for just $0.12 per tube – what an incredible saving! Lavender Bath Salts – Making these lavender bath salts couldn’t be simpler. You need just a few ingredients such as Epsom salts, sea salt, dried lavender buds, and lavender essential oil. From there it’s just a matter of following the instructions. Anti-Wrinkle Cream – Have you ever been tempted by those “miracle” creams that will make you look “ten years younger” that all the major beauty companies produce? Well, most are packed with chemicals, preservatives, and artificial ingredients and on top of that, they are outrageously expensive. Make your own instead! Lemon Lavender Aromatherapy Candle – These Lemon Lavender Aromatherapy Candles burn clear and fragrant — unlike many toxic store-bought candles that release smoke and soot — and will make a wonderful addition to your home. Reed Diffusers With Essential Oils – You can buy one in the stores, but usually they are quite expensive and the scents are made primarily from chemicals. Instead, why not make your own at home? You can use any essential oils you like and can blend different oils together to create an aroma that is perfect for you and your family. Homemade Potpourri – Potpourri is so simple to make it would be silly to pay for it. You can tailor the fragrances to your favorite smells and add some seasonal elements to make it even more special. Homemade Herbal Incense – Incense can be a wonderful way to add a beautiful aroma to your home, so take a look at this fantastic video that shows you how to make your own homemade incense with herbs. DIY Scented Plug-in Refill – This great tutorial reveals how to get rid of the horrible toxic liquid found in chemical-laden store bought plug-ins and replace it with healthy and wonderfully fragrant, toxin-free essential oils. Essential Oil Jelly Air Freshener – The great thing about these jelly air fresheners is that you can add ANY essential oil you want, or even blend a few different oils together. Perfect if you have a particular scent you are trying to create. Homemade Mod Podge – If you are a keen crafter and go through tonnes of Mod Podge, then why not have a go at making some for yourself? You will be surprised at how much you will save. Un-paper Towels – Are you fed up with buying endless paper towels? If so, then this is the answer for you. These will act just like paper towels, but look pretty and are totally reusable, meaning you only have to purchase the materials once. Not to mention they are economically friendly. Homemade Natural Bleach Alternative – If you find bleach cleaners too strong and they sometimes irritate your skin or eyes, then this alternative promises to clean just like bleach but without the harmful side effects. Beeswax Furniture Polish – This is a really simple recipe for a beeswax furniture polish that will restore shine and add gloss to your wooden furniture, returning it to its original beauty. No need for expensive store bought polish! Homemade Bathtub Scrub – A wonderful bathtub scrub enriched with lemon essential oil and a surprising ingredient… ground up eggshells, which give the scrub its abrasiveness and, mixed with baking soda and a citrus-y essential oil, makes this fantastic bathtub scrub a real winner. World’s Best Homemade Laundry Detergent – It is all natural, much cheaper than store-bought (you’ll be saving around $0.16 per load! ), cleans incredibly effectively, and works in all washer types. It’s also safe for septic tanks. Homemade Liquid Dish Soap – This homemade liquid dish soap is fantastic. It’s natural, organic, and antibacterial. Plus it’s a great money saver! To make a 32 oz batch costs about $1.20 compared to $4.47 for the equivalent in Dawn dish soap. All-Natural Foaming Hand Soap – This homemade foaming hand soap is: natural, green, non-toxic, chemical free, organic, gentle, and antibacterial. What more could you want from a hand soap? Homemade Dishwasher Detergent Cubes – These are so simple to make, you just have to mix fiveingredients together — washing soda, Epsom salt, Borax, vinegar, and lemon essential oil — and then allow them to dry. The resulting cubes work wonders on your dishes! Homemade Natural Fabric Softener – Want to make your laundry smell amazing, and stay fresh and soft? Well this is the recipe for you. Most fabric softeners are really toxic and could be harmful to your skin. Natural Disinfectant Spray – It contains just four ingredients: water, eucalyptus, lavender, and tea tree essential oil (all of which can be bought here). The essential oils have antibacterial, antiviral, antifungal, and antibiotic properties, helping to clean and disinfect surfaces in your home without the chemicals and the expense. What’s more, they have a wonderful aroma! Non-Toxic Glass Cleaner – Here’s a great tutorial revealing how to make your own green, non-toxic, all-natural glass cleaner for just $0.45 per bottle! Best of all, this cleaner works better than any commercial cleaner you can buy in the stores – and you can feel happy knowing that you are not putting your – or your family’s – health at risk with toxic chemicals.